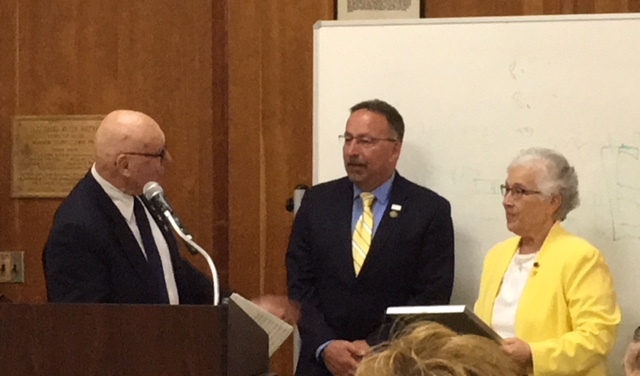 Home /Events / Town of Gates, Monroe County Legislature, & NYS Senate Honors Sister Diana Dolce, S.S.J. On Monday, May 7, 2018, our Executive Director & Founder, Sister Diana Dolce, S.S.J. was honored with two citations, one from the Monroe County Legislature and Town of Gates and another from the New York State Senate. Sister Diana was recognized for her impact on the Gates and Greater Rochester community as a whole through her work at Hope Hall School. Sister Diana’s Mastery in Learning Program© utilized by our amazing faculty and staff has empowered our students allowing them to excel academically and socially at Hope Hall and beyond. We are very proud of Sister Diana and the amazing Hope Hall teachers and staff who are changing the lives of our students every day. Thank you to Monroe County Legislatures, Mr. Frank X. Allkofer, Mr. Tony Micciche, NYS Senator, Mr. Joseph E. Robach, Gates Town Supervisor, Mr. Mark W. Assini, and Gates Police Chief, Mr. James VanBrederode, especially for your continuous support of Sister Diana and our school.